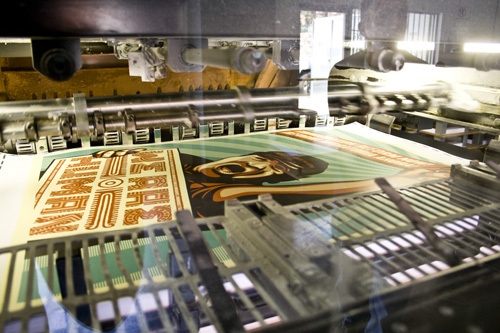 UPDATE: PRINTS ON SALE NOW AT CIMARRONES.ORG!!! I am an immigrant. My ancestors left England and Scotland to come to this land to create a better life for themselves and their families. America is a land of immigrants. Ironically, the people’s who this land was inhabited by before “Americans” were Native Americans North and South American descent. I bring up this history not to stir up controversy or animosity, but to simply point out the complexity of who is entitled to live here. Something that is not complex and should not be controversial is the right of all humans to be treated like humans. People coming to America for the same reasons our ancestors did deserve human rights. 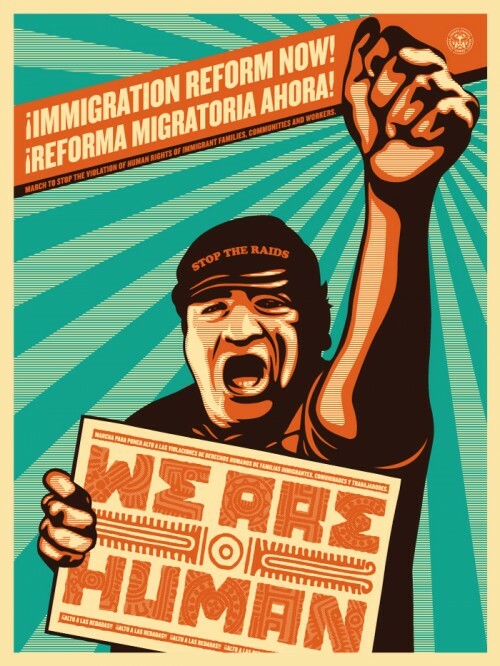 The United States was created by immigrants and now our country needs immigration reform. I collaborated on this project with my co-worker Ernesto Yerena who shot the photos and helped with the graphics. Zack De La Rocha and Producciones Cimarron provided input and support. All the proceeds from these posters go to creating materials for the May Day marches and donations for immigration reform organizations. Thanks for supporting human rights! 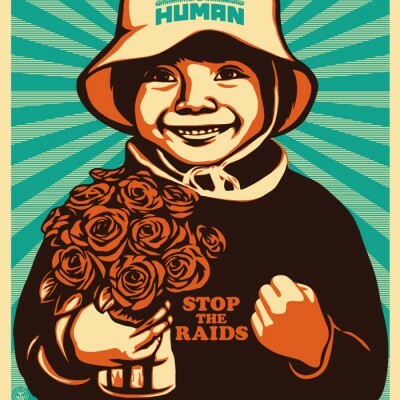 There is nothing criminal about a families search for dignified work and housing. There is nothing illegal about the need to alleviate hunger and find peace and security for people in their communities, or find adequate health care. In my mind these are rights that are universal, transnational, and non negotiable. 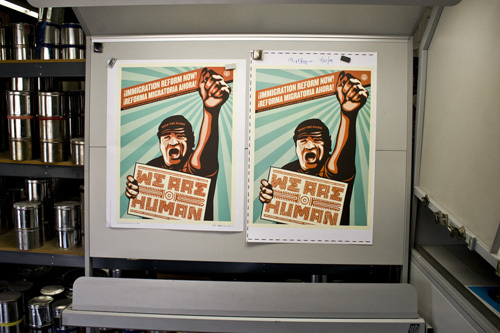 Displaced by corporate globalization and war, the more than 12 million undocumented workers within the U.S. in search of those rights are not only denied the fruits of their labor, but are beaten away from the tree of enormous wealth and services that their sweat has watered for generations. 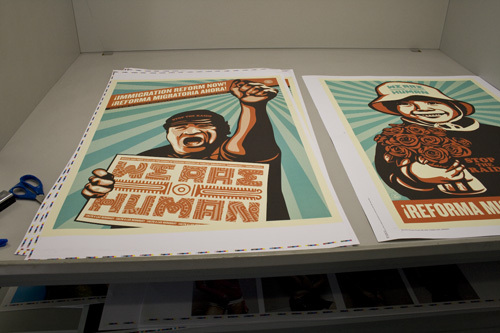 Stay tuned for updates to find these posters at the MAY DAY marches in Los Angeles. 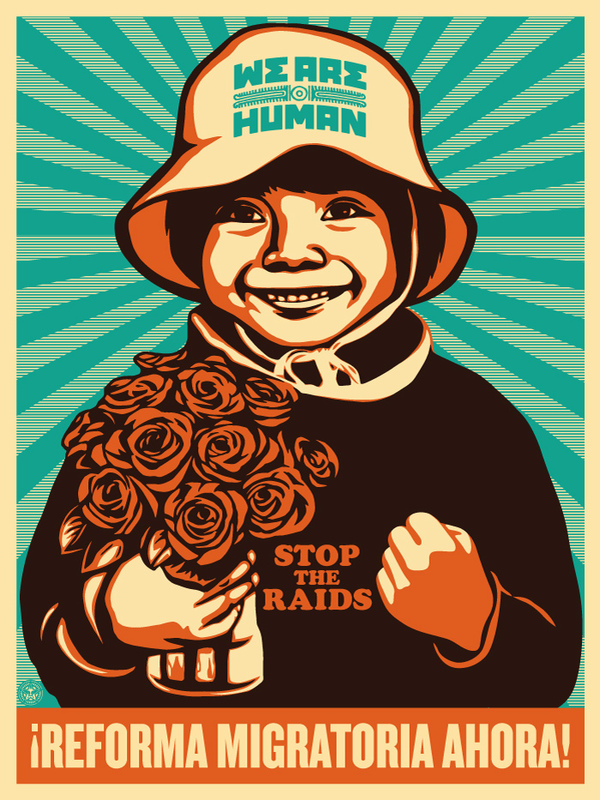 Since the movement lead by the undocumented has re-emerged, the inaction and silence from congress has become deafening. Though the neo-fascist seinsbrenner bill was for the most part defeated, the inability of congress to draft a new more humane and sensible legislative solution has left an extremely repressive and violent vacuum. Most notably the arrogant abuse of power exemplified by Arizona sheriff Joe Arpaio and his deputized vigilantes. His shame full application of the Homeland Security Departments ill conceived 287g agreements have forced entire communities of workers in Maricopa county to live in constant states fear and terror. 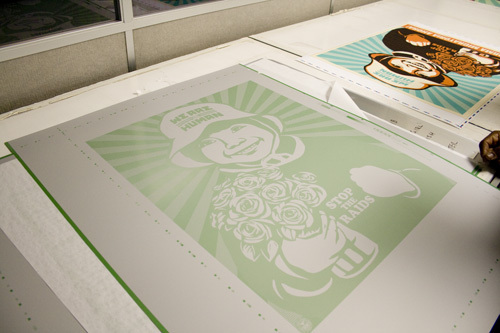 This series of prints designed by Shepard Fairey and Ernesto Yerena originated from photographs taken during the historic 2006 may day march and to me reflect some of that determination and dignity that is driving this most important assertion of workers rights in recent history. I want to thank both of them for they’re work thoughout the years. I also want to thank Marco Amador from Produciones Cimarron for his work and consultation on the project and for his work along side the communities themselves. Hopefully see you in the streets.